Recent popular campaigns in South Asia designed to highlight and root out corruption at both the local and national level show that the subject of ‘justice’, fairness and equitable treatment, remain a pressing issue. South Asian women’s social, cultural, religious and economic position has also repeatedly been identified since the eighteenth century as an area particularly deserving of attention. This has led to a thriving women’s movement, as well as problematic colonial notions of ‘eternally oppressed South Asian women’ that are still used as a symbol to justify a plethora of conservative viewpoints in the West. Hopefully I will be back in the UK in time for the conference! The Selecter are coming to Adelaide, but Morrissey is not. Walking through the city yesterday, I saw this poster. 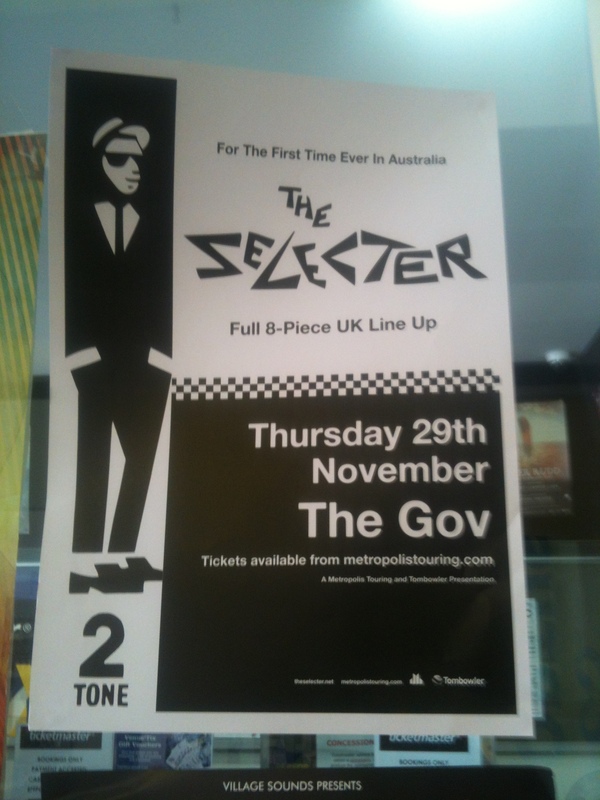 That’s right, UK ska legends The Selecter are coming to Adelaide in November. Yay! We already saw The Specials at Thebarton Theatre earlier this year, and The English Beat played at Folwer’s a few weeks ago (although we missed that one) – it’s like a trifecta of 2-Tone bands! (Yes, I know that The Beat weren’t actually signed to 2-Tone, but they were on the Dance Crazy soundtrack) I also missed the Bad Manners show at The Gov in January, but oh well, that doesn’t really count. (I also missed out on seeing Madness two years ago, but did see The Beat with Rankin’ Roger at Enigma Bar back in 2006) Looks like I’ll have to get out the Fred Perry shirt for this one! In other news, Morrissey has decided to tour Australia, but only do east coast dates. I’m conflicted over what to do. On one hand, he is the Patron-Saint of this blog the man who sang The Queen is Dead and Handsome Devil, but on the other hand, he will probably do a lot of songs from his mediocre post-You are the Quarry albums. I’ll just have to hold onto the memory of seeing him at Trafford Park in 2004, rather than shelling out the megabucks to see him in Melbourne. My post on the reason why the Thatcher Government was reluctant to hold any public inquiries into the death of Blair Peach and the events at Southall in April 1979 was received well. I got some interesting feedback from various people, including journalist Solomon Hughes, who has written for the Monring Star and Private Eye (amongst many others). Hughes pointed me to some articles written by him in the Morning Star and the Socialist Worker on the files that he had FOI’d on the Blair Peach inquest and the bias of the coroner Dr John Burton against the SWP and the broader anti-fascist movement. What Hughes uncovered is some pretty damning stuff, which can be found here, here and here. I think Hughes’ FOI’d material is the reason that the files that I was able to look at Kew were open to the public before the 30 year rule (being opened in 2006-7) and contemporary historians should be grateful for investigative journalists pursuing these historical stories that we might not be able to uncover otherwise (from knowing how to use FOI properly for example). Hughes also mentioned the Thatcher Government was also in disagreement over how to manage the aftermath of the St Paul’s riot in Bristol in April 1980 (which for many was a precursor to the riots of 1981) and has written another article here on the divisions within the Home Office on how to handle affairs after the riot. So hats off to Solomon for this very helpful info! Looks like it’s going to be a big book-buying season! After writing about government inquiries last week and reflecting on my own research, I have been thinking about a ‘watershed moment’ in contemporary British history, particularly in the history of ‘race relations’ in Britain. Between 1979 and 1981, three incidents occurred – the death of Blair Peach in Southall in 1979, the ‘virginity testing’ controversy in 1979 and the Brixton riots of 1981 – which shifted the relationship between the institutions of the state and Britain’s ethnic minorities, particularly the political space that ethnic minorities had access to and the accountability of state institutions to these members of the British public. These volatile and controversial incidents were all handled differently by the British Government and from the archival record, we are starting to uncover the competing factors that influenced the decision-making process for the Government to decide whether to proceed with a publicly accountable investigation. I am interested in seeking out why the Government was able to hinder an official public investigation into the death of Blair Peach in 1979, but then had to concede to an inquiry into policing matters connected to the Brixton riots in 1981. And in between these two incidents, why both the Labour and Conservative Governments tried to stop the Commission for Racial Equality from investigating discrimination within the immigration control system, but finally relented after a High Court judgement against the Home Office. In some ways, I think that these cases represent a turning point in the relationship between the state and ethnic minorities in Britain. Before 1979, the general consensus within government circles was that the institutions of the state (and thus the Government) were largely unaccountable to these members of the community, but by 1981, pressure from Britain’s ethnic communities, alongside NGOs (such as the National Council for Civil Liberties and the Runnymede Trust for example) and anti-racist campaigners, forced the British Government to acknowledge their presence and acquiesced to the Scarman Inquiry. This post may form into a more composed piece of writing in the future, but at the moment, I am going to outline some of background to each incident and some of the archival material that I have found relating to how decisions were made as to whether an inquiry was to occur. On 23 April, 1979, the National Front (NF) attempted to hold a meeting at SouthallTown Hall, a London borough with a large South Asian population. Around 2,000 demonstrators tried to prevent NF members from entering the Town Hall. Over 2,700 police descended on the site of the demonstration, with the Special Patrol Group (SPG) involved in numerous violent clashes as it sought to move protestors away from the town centre. In the ensuing chaos, a number of people were severely injured by the police, with one fatality. Blair Peach, an anti-fascist demonstrator, died from a blow to the head after being chased by members of the SPG. As the death occurred during the dissolution of Parliament, it fell to the incoming Conservatives to decide whether to hold a public inquiry into the events at Southall. On 25 May, 1979, Conservative MP Leon Brittan announced that ‘various inquiries’ were underway and these internal inquiries were ‘the right and proper course to establish the facts of what occurred and to deal with the allegations and complaints.’ Syd Bidwell, the local Labour member for Southall, pushed for a judicial inquiry, but Brittan argued that a decision about this should be delayed until after a report was completed by Police Commissioner David McNee (Hansard, 25 May, 1979, col. 1404) Commander John Cass conducted an internal investigation for the Metropolitan Police, which uncovered a stash of illegal weapons held by officers of the SPG, that could have caused similar injuries to those sustained by Peach. Despite this, Cass’ report was not released and no charges have ever been brought for the death of Peach or the other injuries incurred by numerous persons during the Southall demonstration. In 2010, the Cass Report was finally released and digitised by the Metropolitan Police. The documents relating to this report can be found here. A few months before the death of Blair Peach at Southall, in February 1979, details emerged in The Guardian that immigration officials at Heathrow and at British High Commissions in South Asia had conducted ‘virginity tests’ upon Asian women attempting to enter Britain, particularly those attempting to gain entry on a fiancée visa. Home Secretary Merlyn Rees announced that the Chief Medical Officer, Sir Henry Yellowlees would conduct an internal investigation, hoping to quell the controversy before the 1979 General Election, but the Commission for Racial Equality (CRE) declared that it would also conduct an open and independent inquiry into racial discrimination within immigration control procedures. After the Conservatives gained power, the Home Office tried to quash the CRE investigation, launching legal action to discredit the CRE’s power to investigate an institution of the state and other methods to frustrate the inquiry. As our article in Gender & History has shown, the Home Office argued that the Commission for Racial Equality could not investigate the activities of the immigration control system as it was outside the scope of the Race Relations Act 1976 and launched legal action against the CRE in late 1979. J Woolf, who presided over the case, found that an investigation into the control of immigration was within the parameters of the Commission’s duty under the 1976 Act and declared, ‘I cannot accept that Parliament must be assumed to have intended, as the Home Office contends, that the field of immigration should be a no-go area for the Commission’ (Home Office v Commission for Racial Equality, 1981, All England Law Reports, pp. 1042-50). The CRE were allowed to proceed with the investigation, but the Home Office were not obliged to co-operate with the Commission. Internal Home Office documents reveal that the Government feared ‘potential embarrassment’ if they had to hand over documents and files which they would disclose to Parliament, such as ‘the General Instructions to the immigration Service’, and believed that they could not show ‘files containing officials’ advice to Ministers’. (Letter from Mr Woodfield to Mr Halliday, 14 April, 1981, HO 418/40, NA) Employees in the Home Office were instructed that ‘for presentational reasons’ they had to ‘be seen to co-operate as fully as possible with the CRE’, but demanded that the CRE agree to restrictions placed upon the dissemination of any information obtained from the Home Office. (Note from Elizabeth Moody to Neville Nagler, 6 April, 1981, HO 418/40 338797, NA). The Yellowlees Report was only released to MPs in Parliament and no copies were made available to the public. The text of the report has only come available in the last year as the National Archives have now opened all of the files relating to the Yellowlees investigation. On the other hand, the CRE report was not released until 1985, into a very different political landscape. In April 1981, a riot broke out in the London borough of Brixton, where a large Afro-Caribbean community lived. The riot, which saw both black and white youth participate, was started by a confrontation between a group of black youth and the police, but was also the result of years of police harassment and other forms of institutional racism experienced by Brixton’s black community, coupled with the strict socio-economic policies of the Conservative Government. After the Brixton riots, Lord Scarman was appointed to launch an inquiry into the events. Unlike the other two controversial incidents, the archival record does not show any hesitation or debate by the government on establishing an inquiry into the riots. On 13 April, 1981, a statement by the Home Secretary declared that under Section 32 of the Police Act 1964, Lord Scarman had been invited to undertake an inquiry (partially based on Scarman’s overseeing of the 1974 inquiry into the death of Kevin Gately at Red Lion Square during an anti-National Front demonstration). The terms of reference given to Scarman were quite broad: ‘To enquire urgently into the serious disorder in Brixton on 10 to 12 April and to report, with the powers to make recommendations.’ (Statement by the Home Secretary Willie Whitelaw, 13 April, 1981, PREM 19/484, NA). There is the possibility that the Scarman Inquiry was launched to investigate why the disorders had seemed to take the police by surprise and form part of a ‘law and order’ narrative that would condemn the rioters and support the police, but in practice, Lord Scarman did not take this approach, and sought to uncover the socio-economic, political and criminogenic conditions that allowed the disturbances to occur. The long process between the Scarman Report in 1981 and the Macpherson Inquiry in 1999 is important because it demonstrates a growing recognition at the official (and public) level that the institutions of the state could be responsible for racial discrimination and a recognition that these institutions should be held accountable, with a greater emphasis on transparency of government agencies. Although the Scarman Report referred only to the accountability of the police, the same calls for transparency were directed at the immigration control system and the Home Office after the ‘virginity testing’ controversy. The argument used by the Home Office in 1980 in their court action against the CRE’s investigation into immigration control procedures became increasingly implausible to defend as the Scarman Report got underway. As Marinella Marmo and I have argued in a forthcoming article available in this collection, police have had greater accountability enforced upon them since the 1980s (such as the Police and Evidence Act 1984), but the immigration control system has not undergone the same level of transformation towards accountability. The immigration controls system has continued to rely heavily upon the discretionary powers of individual immigration officers, where accountability and scrutiny have been difficult to implement properly. An eventual report into discrimination within the immigration control system was published by the CRE in 1985, but the Conservative Government disregarded many of its findings and in the meantime, had placed further restrictions on immigration to the United Kingdom. Further riots occurred in 1985 which led many to question how much the Government and the police had learnt since 1981, with further inquiries undertaken. A quick hypothesis that might be deduced from this may be that governments have learnt that, in some ways, it was better to allow a public inquiry to investigate controversial events,* but the implementation of any reforms leading from these inquiries could be minimised in the future. However this approach is not always taken, as David Cameron was quick to dismiss a public inquiry after the riots that broke out in August last year across Britain. *Something else that I need to explore is the theory that public inquiries are established as a spectacle that is used to distract public/media attention and absolve the government from undertaking reforms. In the last two days, two reports have been released (or re-released) that I would like to mention. Firstly, the Hillsborough Independent Panel released their long-awaited report into the Hillsborough disaster of 1989. The extensive examination of the archival record of the various agencies involved in the events of 15 April, 1989, released by special request of the Home Secretary in spite of the 30 year rule imposed on government records by the Public Records Act, has uncovered a wealth of information that gives us the clearest possible overview of what occurred that day. The report has found that a number of transgressions were perpetrated by the authorities to put the onus of what happened on the football fans, rather than the actions of the South Yorkshire Police and the emergency services. The Panel’s website, with access to the documents and the final report, can be found here. There is reason to believe that the systematic archival research and analysis conducted by the Panel may serve as a framework for future inquiries. I think David Conn’s article on The Guardian‘s website is a good piece on the report, and I would also recommend this blog post by John Drury at the University of Sussex. Secondly, Andrew Zammit, a researcher with the Global Terrorism Research Centre at Monash University, has been able to get the National Inquiry into Racist Violence, conducted by Australia’s Human Rights and Equal Opportunity Commission in 1991, digitised and put on the web, freely available to everyone. The report can be found on the Australian Policy Online website. This was the first national inquiry into racist violence in Australia and was important in acknowledging the extent of racist violence in Australia at the time, as well as instrumental in the Keating Government drafting racial vilification legislation in the mid-1990s. The inquiry was established in 1988 following a series of well organised attacks against church and community leaders, as well as complaints from Indigenous people and ethnic community groups. Despite intimidation and the fear of retaliation, almost 1,000 people came forward to give evidence. The inquiry found racist violence against Indigenous Australians was endemic, nation-wide and severe, with racist attitudes and practices ingrained in many institutions. Racist violence on the basis of ethnicity, while not as extreme as in other countries, was also a serious concern. A key recommendation of the Inquiry’s report was the need for legal protection against racial hatred. In 1995 the Racial Discrimination Act was amended to make racial vilification against the law. Thanks should be extended to Andrew for his efforts in getting this report digitised and available online. Are there similar blogs that people can recommend?